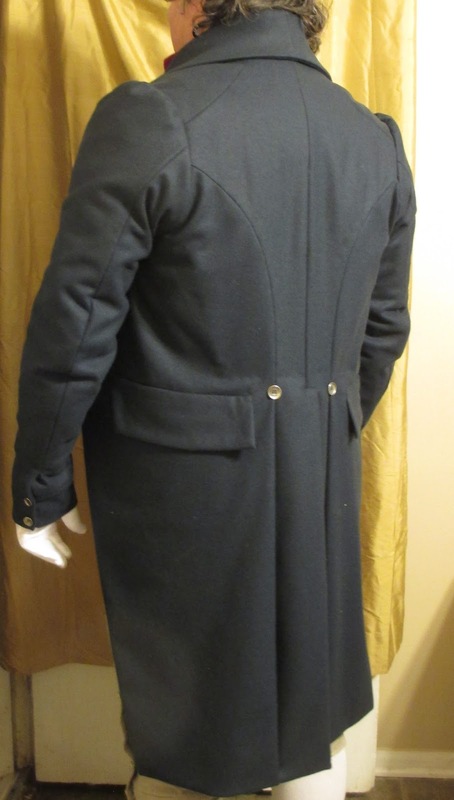 The next commission I completed was for a tailcoat only. Although both clients requested dark blue wool for their fabrics, the two coats came out very differently. I ended up using a heavier wool for the second coat, and because of that it made more sense to finish the edges with a blunt-cut treatment. The wool is very well fulled and will not ravel, so I simply placed the wrong sides of the pieces together, sewed along the stitching line, and cut off the excess seam allowance. It made for a very sharp finished look, without all of the bulk that turning in the seam allowances would have added. What a difference fabric choice and design options can make! 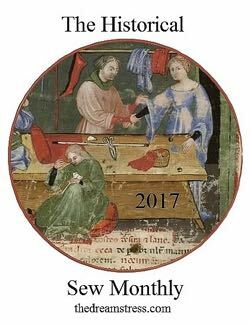 My first big commission was completed several months ago, and I'm just now getting around to blogging about it. I have an excuse, though. In the intervening months I have taken on and finished two more commissions of similar magnitude, and I will be blogging about those soon. Commission Number One was a tailcoat and waistcoat for a customer who wished to replace his kilt that he had been wearing to English Country Dances with a more suitable Regency ensemble. 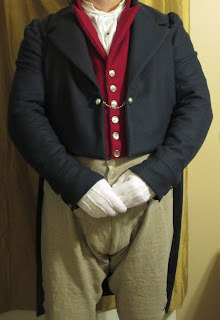 He purchased a shirt and pair of breeches from Jas. 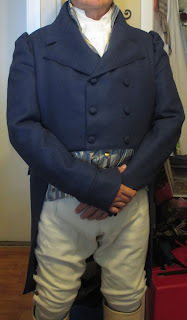 Townsend, but came to me for a custom tailcoat and waistcoat. I also ended up making him a cravat to complete the outfit. The final coat turned out rather well, if I do say so. We opted for a single-breasted front, closed with two buttons on a chain. 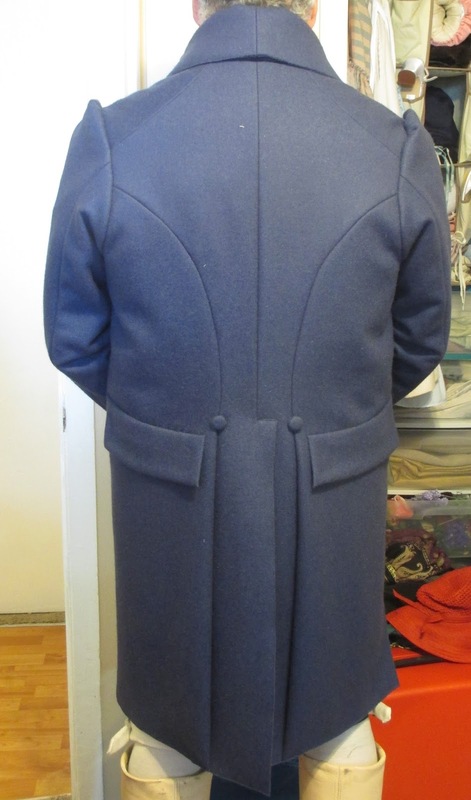 Behind the coat you can see the first two tailcoats I made for Brian the Engineer. I used them as reference while sewing. 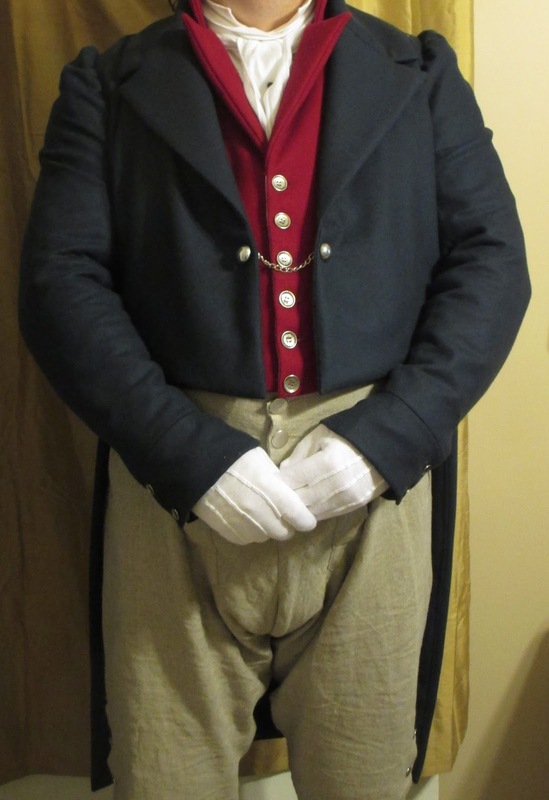 The red wool waistcoat provided a beautiful contrast to the navy wool coat. Both fabrics were purchased from Burnley & Trowbridge. The client requested all silver buttons. Looks rather good, doesn't he? He wore the ensemble to a ball the following weekend. 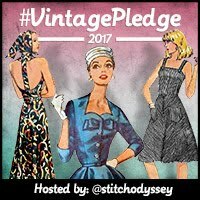 My first straw hat refashion was so successful, I couldn't wait to do more! 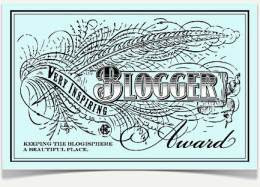 Although in reality, as with everything I do, it wasn't until I had an event (for which I needed to dress myself and three other ladies in Regency attire) that I actually started on them. 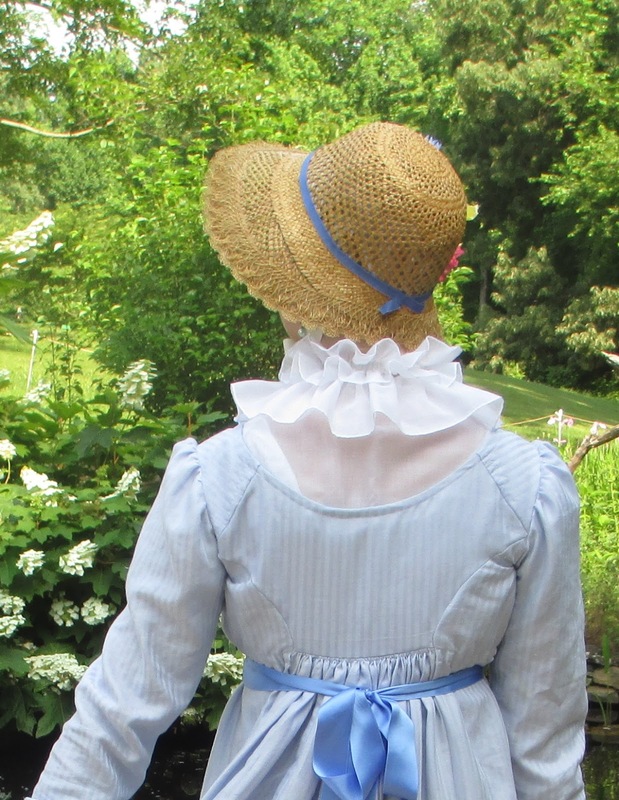 Sadly, after I had finished two new bonnets, the event was canceled and they were no longer needed. Oh well. They will still be useful, and I have since worn one of them to a later Regency event. I bought them at Goodwill. The first one has such a fascinating weave, and I felt it would be a lovely and cool bonnet for the summer season. The second one was one of three identical hats that I considered purchasing, but I decided to just get one for now and see how it worked out. Now I kind of want to go back and get the other two, if they're still there. The next step was, of course, to wet the straw. When it had soaked enough to become pliable, it was time to re-shape the brim. I used one of my new Hat Shapers to do this, and at the same time to fix the dent in the crown. This is the Multi-Way Bell, along with the hat block I purchased on Etsy a while back. Because the brim was larger than the form, I didn't press it tightly down, but used the edge as a resting place for the outer edge. Because of this, the brim is not as smooth as it could be, and has small waves that refuse to flatten. Oh well. Next I repeated the same steps with the second hat. Only with this one, there were no decorations to remove. I didn't need to re-form the crown at all, as it held its shape really well. I set the hats outside to dry in the sun. The grill made a handy stand. Once the first hat had dried sufficiently, I began the most daunting part - trimming the brim down to the shape and size I wanted. I had a very general idea of how I wanted to go about doing this, and I was very nervous that I would wreck the hat in the process. First I marked the two spots I wanted to cut to with pink pins, to make sure I cut the sides evenly. Once again I repeated my steps for the second hat. This one I left a little more at the back of the crown, because I planned to turn it under like the edge of the brim. The straw was still slightly damp when I did this, so the shape got distorted a bit. I didn't worry about this, as I knew I could just reshape it again later. Lastly, because I had removed the ribbon binding from the outer edge of the brim, I needed something to cover it. I used more of the millinery lace from the first hat refashion, as it was a beautiful color match for this hat as well. I pinned it so that the scallops of the lace just extended beyond the cut edge of the straw, and stitched it down by hand. The inner edge of the lace is very malleable, and shrinks down very nicely to fit the smaller circumference it was pinned to. Oh, one final thing. Remember that hole in the back of the hat? I still needed to fix that. I was quite pleased with my efforts, and fairly confident that no one would notice the repair unless it was pointed out to them. Finally, the new bonnets in action, trimmed with flowers! Both are comfortable and fun to wear. I added ribbon ties to the open-weave one, but used a hat pin for the solid-weave one. It fits close enough to my head that this keeps it on quite securely.